Purplebricks launched in Australia in August 2016. Last week's trading update piqued my interest in its market traction in Australia, which led to several interesting observations. All data is publicly available from the top property portal in Australia, realestate.com.au. To begin, let's look at overall market traction. The chart below shows the number of houses sold each month (as reported on the portal). There is clear, continued growth in its two launch markets, while NSW is off to a promising start. The overall numbers are still low, but there's a promising and unmistakable upward trend in all markets. Purplebricks currently list 26 LPEs (Local Property Experts) in Queensland, 20 in Victoria, and 12 in NSW. Given the monthly sales figures above, we can calculate an approximation of many properties each LPE is selling per month. NSW is quite new, so it makes sense that the ratio is lowest there. But in the two, slightly more mature markets, you can see that each LPE is selling between two and two-and-a-half properties each month. At the time of writing, there are 346 properties listed for sale in Queensland, 196 in Victoria, and 83 in NSW. Given the same LPE numbers, we can plot out the total number of current listings relative to LPEs. There are a number of factors that could influence these numbers. It could be a reflection of average time on market; perhaps there are more listings per LPE in Queensland because it takes longer for properties to sell. Or it could be a reflection of timing; it may take several weeks for a new LPE in NSW to become fully productive with acquiring new listings. The real magic will be in seeing how these ratios change over time, so stay tuned! Looking at the listed sale prices of just under 500 properties gives us a look at what segment of the market the Purplebricks proposition appeals to. The chart below shows clear clustering in Queensland, where Purplebrick's median sale price is $493,000, below the overall market median home value of $655,000. Likewise, sale prices in Victoria are also well clustered around a slightly higher median sale price of $530,000, compared to the overall market median home value of $826,000. 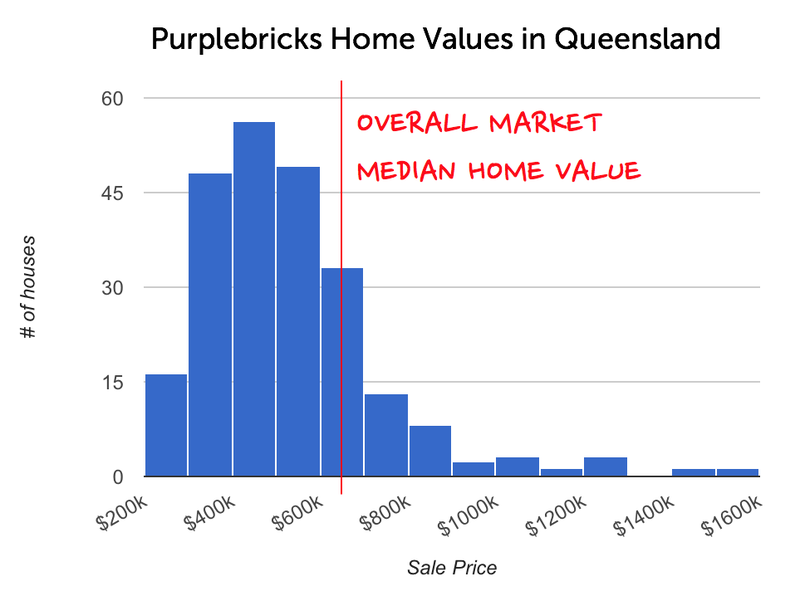 As is clearly evident from the two charts above, the median home values in both Queensland and Victoria are higher than Purplebricks' median sale price. A reasonable conclusion would be that the Purplebricks offering and proposition currently appeals to the (slightly) lower end of the market in Australia. Is it true that owners with high value homes are still more comfortable using a traditional real estate agent (even though they could proportionally save more on commissions by using a service such as Purplebricks), or is it still early days with Purplebricks building trust in a new market? Regardless, it's clear that the proposition is resonating with a growing number of consumers. Next stop: The U.S. market.